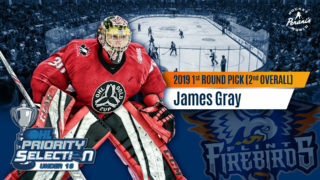 Flint, Mich. – The Flint Firebirds added two new prospects to the organization in the second annual Under-18 OHL Priority Selection, Wednesday, Apr. 11. The Firebirds selected two forwards, Markus Paterson and Russell Oldham. 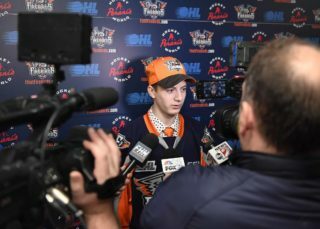 The Firebirds selected Paterson in the first round (2nd overall). Paterson has spent the last three years with the Toronto Nationals AAA hockey team in the Greater Toronto Hockey League (GTHL). This season, the Toronto, Ont. native racked up 41 points (19G, 22A) in 50 games and played an integral role in helping the Nationals capture the GTHL Midget Major playoff championship. Paterson, a 6-foot-2, 182-pound left-winger was voted as the most improved player with the Nationals this year and secured back-to-back Kraft Cup championships over the past two seasons. Since 2008, the Kraft Cup has been awarded to teams who hold the best regular season record in their GTHL division. Paterson will also compete for the Telus Cup this Apr. 23-29 in Sudbury, Ont. The Telus Cup is Canada’s national midget ice hockey club championship and the Nationals are one of six teams remaining. Flint than added Oldham in the second round (22nd overall). The St. Thomas, Ont. native tallied 53 points (24G, 29A) in 35 games last season with the Huron-Perth Lakers Midget Major AAA hockey team. A 6-foot-1, 164-pound left-winger, Oldham also scored three goals and added one assist, totaling four points in three regular season Jr. B games with the St. Thomas Stars in the Greater Ontario Junior Hockey League (GOJHL). Additionally, Oldham has been invited to the ALLIANCE Hockey All-Star Game for the last two consecutive seasons. The Under-18 Priority Selection concept was developed a year ago with full support from Hockey Canada’s three Ontario Branches including the Ontario Hockey Federation (OHF), Hockey Eastern Ontario (HEO), and Hockey Northwestern Ontario (HNO), to assist in the growth of Midget hockey and provide further opportunities for players at different stages of their hockey development. Fans can meet the newest Firebirds at the orientation camp April 20-22 at Iceland Arenas on Elms Rd. in Clayton Township. The Firebirds are inviting fans to the annual tailgate party and ‘Blue vs. White Game’ Saturday, April 21st from 2-6 p.m. 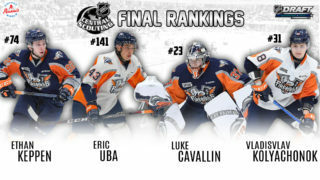 Immediately following the game, fans can meet and greet current Firebirds Luke Cavallin, Marcus Gretz and Ethan Keppen as well as 2018 first-round draft pick Evan Vierling, Vice President of Hockey Operations & General Manager Barclay Branch, the coaching staff and all of the Firebirds’ OHL draft and free agent prospects. There will be music, complimentary hot dogs, beverages and a kids fun zone sponsored by Funtastic Inflatables. The event is open to the public and will happen rain or shine. Early bird ticket packages for the Flint Firebirds 2018-19 OHL season are on sale now. $50 reserves your seat for next season! Special early bird price deadline is Monday, April 30th. Purchase at the Dort Federal Event Center Box Office or the Firebirds front office, Monday thru Friday from 9AM to 5PM. For additional pricing and ticket information, contact Dominic Gutierrez at (810) 701-8536 or email domg@flintfirebirds.com.